Six slams rock, punk and metal together and digs a recognizable groove into the world of hard music. This stuff is deep and dark and will loosen your wisdom teeth if you get too close. However, it’s not so brutal that you get tired and walk away from it; "Between the Warning and the War" does have some melodic interjections and some heavy solos courtesy of Alfunction. The metal element applies to the guitars and the house leveling riffs between both gitfiddle players. The punk attitude comes from Lauren; he’s not bashful about telling you where to get off and he’ll even kick you when you’re walking away. The music is refreshing because it's got a nu-metal sound but the fact that it’s categorized as that shouldn’t make you roll your eyes in disappointment. Because I’d never heard Six before, I thought they sounded like Saliva. Six is a little heavier, but if you’re a fan of Josey Scott and company, you’ll love this too. Six: Lauren – vocals; Alfunction – lead guitar; Johnny Utah – rhythm guitar; Nate Bowers – drums; Corey Bush – bass. For more information, check out http://www.sixmusic.com. Two things that I noticed about the band Six right off: First, what a great name for a band and, second, this band is as good as their name. The vocals are tight and very well done. Lyrically, you know just a few tracks in that the songwriter has some serious issues. 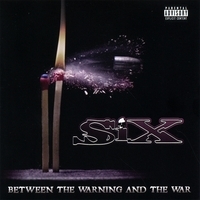 This is powerful metal with considerable energy and, if you don't get too depressed by the lyrics, you can have a good metal experience from "Between the Warning and the War." High marks for musical presentation; however, they get points deducted for depressing me with the lyrics. When "The Price of Faith" opens with virtually the identical monologue as Iron Maiden's "Number of the Beast" (you know the one, "...for it is a human number, blah blah blah"), you have to wonder what you're in for. The CD cover looks vaguely like KISS's "Music From the Elder" while the intro brings to mind one of heavy metal's most popular numbers about Satan. But then the first track, "Something's Gotta Give," kicks in and you realize you're in for a whole different world of metal. The music here has more in common with the later CDs of Mushroomhead and Powerman 5000 than KISS or Iron Maiden, with modern metal beats, slashing guitars and intense choruses that dare you not to get hooked into them. The livelier numbers of the CD keep it rolling ("Something's Gotta Give," "Everything," "We All Lie," "Stranger, Killer, King," "Leave Me Dry") while other numbers tend to fade off into filler territory ("The Only Ones," "Sad State of Apology (I Want It All)"). Thankfully, the better tracks outnumber the weaker ones and even the weaker ones aren't intolerable. The end result is that "The Price of Faith" is a killer CD with a modern metal sound that doesn't deteriorate into the destructive clichés of nu-metal or the chaotic intensity of the more extreme. 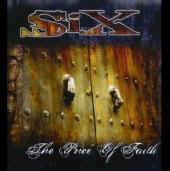 Six: Lauren - vocals; Alfunction - guitars/programming, additional vocals; Rob Wood - drums; Bob K - guitars, bas/programming; Gary Pickus - additional vocals, keyboards, piano.